The Romans created a network of roads all across the empire. Initially, they were built to move troops to and from trouble spots. They were also used for speedy communication and ease of pre-motorized travel. Roman roads, specifically viae, were the veins and arteries of the Roman military system. Through these highways, armies could march across the Empire from the Euphrates to the Atlantic. They say, "All roads lead to Rome." The idea probably comes from the so-called "Golden Milestone" (Milliarium Aureum), a marker in the Roman Forum listing the roads leading throughout the Empire and their distances from the milestone. 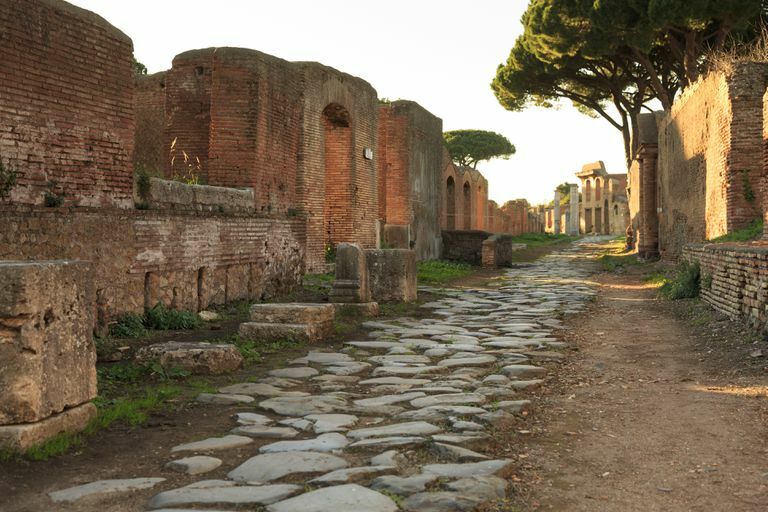 The most famous Roman road is the Appian Way (Via Appia) between Rome and Capua, built by the censor Appius Claudius (later, known as Ap. Claudius Caecus 'blind') in 312 B.C., site of his descendant Clodius Pulcher's murder. A few years before the (virtually) gang warfare that led to Clodius' death, the road was the site of the crucifixion of the followers of Spartacus when the combined forces of Crassus and Pompey finally put an end to the slave revolt. In Northern Italy, the censor Flaminius made arrangements for another road, the Via Flaminia (to Ariminum), in 220 B.C. after the Gallic tribes had submitted to Rome. As Rome expanded, it built many roads in the provinces for military and administrative purposes. The first roads in Asia Minor were built in 129 B.C. when Rome inherited Pergamum. The city of Constantinople was at one end of the road known as the Egnatian Way (Via Egnatia [Ἐγνατία Ὁδός]) The road, built in the second century B.C., went through the provinces of Illyricum, Macedonia, and Thrace, starting at the Adriatic at the city of Dyrrachium. It was constructed by order of Gnaeus Egnatius, proconsul of Macedonia. Milestones on the roads give the date of construction. During the Empire, the emperor's name was included. Some would have provided a place for water for humans and horses. Their purpose was to show miles, so they might include distance in Roman miles to important places or the end point of the particular road. The roads did not have a foundation layer. Stones were laid directly on topsoil. Where the path was steep, steps were created. There were different paths for vehicles and for pedestrian traffic. "Etruscan and Roman Roads in Southern Etruria," by J. B. Ward Perkins. The Journal of Roman Studies, Vol. 47, No. 1/2. (1957), pp. 139-143. A History of Rome to the Death of Caesar, by Walter Wybergh How, Henry Devenish Leigh; Longmans, Green, and Co., 1896.